PARIS – In further reference to my post of yesterday where I speak of yet another open mic that has been closed down for reasons linked to a Draconian attack by the authorities against live music in Paris, I have decided far too late to create a section on my Thumbnail Guide to Paris Open Mics, Jam Sessions and other Live Music on which I will place the bars and venues that had open mics until they were attacked by the authorities and told that they had to stop until further notice. I have put this list there because I realize that over the last couple of years I have had to wipe out one after the other from my list, and the hope is that eventually these open mics will return. So people who are curious can check up the names of those in purgatory to see if they are running or not. I wish, for instance, that I had been able to put the information of the open mic at La Féline bar into that area, but I just wiped it off the page once I learned that La Féline was permanently closed due to these attacks by the authorities. Anyway, so check out the page and its new purgatory section, which will also serve as a kind of epitaph to each of these wonderful establishments (or at least their former open mics). You will find it on my Thumbnail Guide to Paris Open Mics, Jam Sessions and other Live Music. Here is an article from Libération that talks about this sad phenomenon of closing of live music joints in Paris – which has been reported widely elsewhere as well. 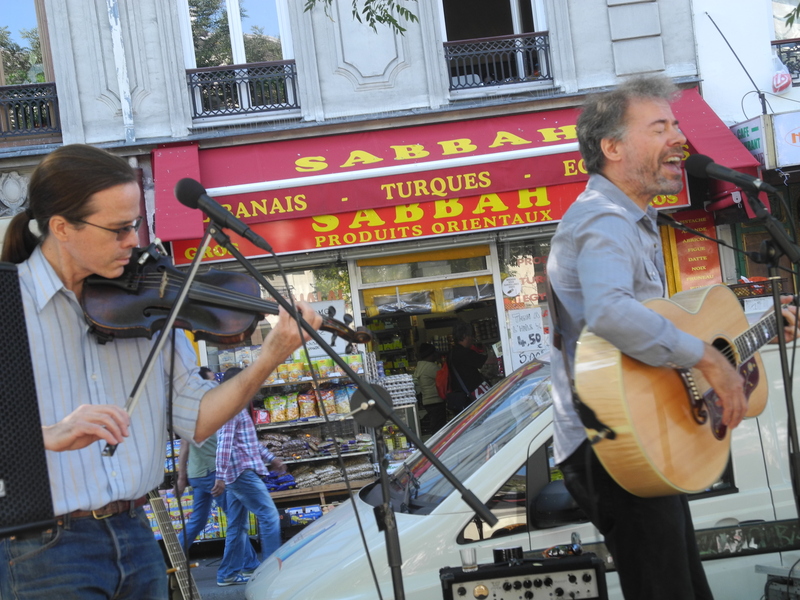 PARIS – I had some more really bad news for Paris open mics and jam sessions the other day when I learned that the fabulous Cave Café jam is no longer happening due, it seems, to another move by Paris police to enforce certain regulations. I don’t know exactly which regulations these are, but there have been several articles in the French press talking all about the endless closing down of live music joints in Paris due to the police enforcing sound regulations, safety regulations, and other regulations that are designed to destroy the musical culture and nightlife of an increasingly gentrifying city. It was so depressing to hear that one of my latest favourite places for a jam was no longer in action. I hope it starts up again soon. But immediately follow that news came an invitation for me to do an opening set for a young Paris rock band at a place that I know very well, but have not been to in years. And going last night to play, I was not just relieved, but absolutely ecstatic to find that this bar/venue, Le Truskel, is not just alive and kicking, but it is almost exactly the same as it was when I first played there 10 years ago! Le Truskel is the place where Earle Holmes’s open mic moved to after it started at the Shebeen and then went briefly to the Lizard Lounge. So it was that in exactly this same period of time a decade ago I began playing every Monday night at the fabulous open mic Earle ran at the Truskel, until he basically quit the open mic business (except for a brief period when he got me to host a Sunday afternoon open mic at the Mecano Bar in Oberkampf, where he was working at the time). There is a magic at the Truskel, with its fabulous stage space, DJ area, dance floor/audience space, horseshoe-shaped bar and now also for many years, the incredible labyrinthine basement room. That room, smokers will delight in, has now been fitted with the necessary apparatus to make it a smoking room. Last night I just loved that while the gig was going on upstairs, downstairs there was a group of 25 or so soccer fans watching a local match and going crazy with chants and whatever else they go crazy with, and nothing upstairs was being affected by this mayhem. The bar has a big following of regulars, mostly people in their twenties, but it also has plenty of older regular clients, and a long, long tradition of nurturing young bands. The band that invited me to open for them last night was called Britches, and it is an international mix of performers, the lead singer of which – Nadeem Hakemi – is a Canadian from British Columbia, with Afghan heritage. I was flattered as hell to be invited to open for them, which apparently resulted in the interesting turn of events of Nadeem having been a fan of this blog for a while, and then discovering my own “heritage” in the article that I wrote for the Canadian national newspaper, the Globe & Mail, about my return to play music after decades away, at…Earle’s open mic at the Lizard Lounge. So how extraordinary that I should be invited to open for them at the Truskel! I felt very much at home onstage doing just an acoustic set with my Gibson an no accompaniment. It really, truly, felt as if time had stopped from the 10 intervening years and that I was there again on stage at another open mic run by Earle. Well, ok, it was not utterly bursting at the seams with all the regulars that had shown up week after week for those insane open mics, but the Truskel had not changed one single bit. And that is hugely great news for the Paris live music scene. Especially for the young up-and-coming groups like Britches. In fact, Le Truskel is not just great for young up-and-coming bands: It has hosted such established acts as Pete Doherty, Baxter Dury, Metronomy and incarnations of bands of Johnny Borrell of Razorlight fame…. In fact, it was also a funny, fitting thing that Borrell and Razorlight are performing at the Bataclan tonight. By the way, it was also a great opportunity for me to have a chance to try out my “Lay, Lady Lay,” cover of the Dylan song for the first time in public in preparation for the fabulous gig I will take part in on 19 February at that other famous music venue in Paris, Le Reservoir. That is a show called “Back in 1969,” which will, as its name indicates, celebrate the music of 1969 – ie, 50 years ago – with a diverse collection of very interesting musicians, including the French/Portuguese star, Lio, and Laura Mayne, who was part of the duo called “Native.” There will also be my faithful sax player friend and sometime accompanist, Stephen Cat Saxo – so I’m hoping to feel as at home at Le Reservoir as I did last night at Le Truskel! P.S. Oh, yes, of course, I had to do my Mad World cover! Thanks to Ornella for filming – and also starring in one of these videos…I wonder which one…. So here is the page devoted to tying together the pieces of the open mic adventure that I have lived in Paris since I first started. PARIS – Menilmontant is a funky cool quarter of Paris, and this weekend it celebrated a funky cool arts festival on the boulevard, with artists and artisans displaying their wares in the middle of the boulevard, and musicians playing on two different stages at either end. I was invited to play in the festival by a musician I met at the open mics, who calls himself She-Me, and who was organizing the talent on the stages. I leapt at the opportunity of playing outside on this open-air, middle of Paris, middle of Menilmontant stage, and as it turned out, the day would be one of the sunniest and hottest of recent weeks, and probably the real end of summer too. In any case, it seemed like the sun had come and the clouds had parted in order to create the absolute perfect weather for a street festival in Paris. And that ensured a large number of people talking part, passing by, and generally giving an atmosphere of a country fair to the center of Paris. I made discoveries amongst the artisans, the musicians and the local businesses all afternoon long. The festival is just winding down as I write these words, and it had started Friday evening. I was a little jealous when I saw the big stage, but once I got to performing on the smaller stage, I realized that I had perhaps got the better deal. It was much more intimate, the passersby could stop if they wanted to – without making the commitment of standing in front of the big stage, but just sort of stopping at the edge of the small stage and checking it out, and I had better eye contact with the audience. The small stage was also set up in a spot where I could look off at the facing cafes and the place where the Métro exit sits, and feel really as if I was kind of floating around in Paris playing my music to all who cared to listen, and even those who did not. Helping me out on that was my friend Joe Cady, backing me up with fiddle and lead guitar, just as he has done in Paris open mics for several years now, and at the F1 FanZone concert that we did at Queen Elizabeth Olympic Park in London in July. Joe’s fabulous accompaniment was just what I needed to feel completely at ease in providing the passersby with a full musical experience. Of course, that was helped by the good sound system also, that ensured a crisp and clear sound to my vocals and some adequate mixing on the rest. The festival was organized by an association called ArtMachine, that has as a goal to help artists, artisans and musicians show off their creations. Now, if only every quarter in Paris could come up with one of these. The free meal ticket providing food at a local North African restaurant was absolutely insanely good, as I found all the main dishes cost the price of the ticket of a measly 7 euros, and the food was amazing! My lamb chops and french fries beat just about any I’ve eaten recently in other French restaurants for twice the price. Menilmontant really feels like a village within the bigger Paris, and I would live there at the drop of an equally cheap apartment! 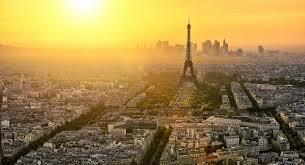 PARIS – Thursday night was the May 1st public holiday, the Fête du Travail, in France. So it was a great day to think of nothing but maybe going to attend a little gig by some friends and acquaintances that I have met at open mics in Paris, and who have now decided to perform as often as possible in gigs as opposed to open mics. Well, not all of them. But in any case, I’ve mentioned or filmed each of these performers on my blog in the past, and seen a couple of them several times, and one just once. They all impressed me and showed me another side of their talent at this entirely entertaining 2 and a half-hour gig they put on at very neat bar venue called L’Angora, just off the place de la Bastille in Paris. I’m talking about the French guitar player singer who calls himself Ventru; about the American singer songwriter from Seattle, Shelita Burke; and about the visiting American from San Diego, Aaron Bowen. Together, they put on a highly entertaining evening that allowed the fairly large crowd or spectators to see different sides to their talent than what their open mic appearances allow for, due partly to the often raucous spectators at open mics, and the often bad sound systems, and the often too low quota of songs. Ventru started the show, and played his distinctive rhythmic guitar style and vocals in French; he was followed by Aaron Bowen, who deftly managed to pull of a different style of song in just about every single piece he played, from quiet, ethereal singing melodies to hard hitting rhythms and jazzy leads and chords….all of which was tied together by his own unmistakable style. And then the evening was closed by Shelita, with her hard hitting rhythmic guitar playing and vocals that for me seem to be a cross between Tori Amos and Bjork…. I just was not bored throughout the evening. 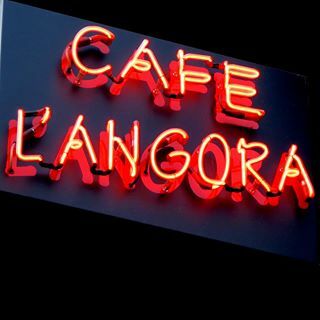 And the Angora is a great discovery: Located at No. 3 Boulevard Richard Lenoir, it has a real 19th Century feel to it both on the ground floor with its fabulous long, oak bar, its old fashioned ceiling mouldings and on the first floor where the music takes place, in a low-ceilinged private room with a piano, carpet and great acoustics. There is a blue jam on Sundays, but on the ground floor, since they do not have the right to use drums on the first floor. Definitely worth the visit. PARIS – In 30 years living in Paris I never set foot inside the Hotel de Ville until last night. At the invitation of a friend, who is a friend of one of the band members, I went to see the African band Debademba in the great salon of the Hotel de Ville. The band was giving a concert to celebrate Ramadan. The inside of the Hotel de Ville, in fact, is well worth a visit. It is massive and ornate and just…extraordinary. I have done no research on it, so I will leave this blog description as silly and basic as that. There were hundreds and maybe even more than a thousand people present in the vast room for the music, which started with a maghreb band walking around playing drums and some kind of screeching horn. I did a bit of research on that, and thought it was something like a bombarde, often used in Brittany, but I could not really name it accurately. But Debademba were just fabulous. The guitar player, Abdoulaye Traoré, is really strong, and the vocalist – who sings the guitar player’s compositions – had an amazing high-pitched, almost feminine voice. The music was a mixture of everything, with a strong overtone frequently of jazz fusion. I had never heard any African music in concert that was like this, and it was very strong. The band was particularly good at understanding an audience, too, as just about every song was different, had a different tempo, mood, melody. PARIS – I love discovering new music venues, and a couple of nights ago I went to a friend’s concert at a place I had never heard of, in Paris, on the “other” side of the Sacré Coeur, and it turns out the bar has existed for music since 1984. How could I have not been there before??? Well, probably part of it is that I so rarely go to other people’s gigs and concerts, being always out doing open mics myself. And because I’m going out to open mics almost every night of the week, I’m always going to the same venues, and not making new discoveries. This bar is called Bab Ilo, and it is a small, cosy bar on the ground floor, with a basement room of the more or less classic Parisian style, where the stage is and the music takes place. It is a very, very cramped quarters in that basement room, and it would be fabulous for an open mic, but Bab Ilo is usually used to host jazz evenings, Latin music, comedy and other recitals. When I arrived for the show, I ordered a beer and paid my five euro entry fee, and went down the narrow staircase to find the room so packed that there was no sitting room – or at least, only on the floor, since all seats were taken. That meant that I managed to catch only one bit of the first act on video, and the camera is CONSTANTLY moving as I evaded movement of people standing in front of me, and as I moved my body with the push and shove of other people’s bodies, etc. That one video was of the woman who organized the three-part concert, Jeanne La Fonta. She sings amusing, clever, sometimes tongue-in-cheek songs, recites poetry and other writings, and… well, you’ll see in the video. But don’t get sea-sick with my movements. After her I managed to move down the room to near the front of the stage where I saw on the doorstep to some other room, and I then managed to get a seat at a table after all, as the evening progressed. I also managed to get a few videos of the second group of the evening – although my placement was not perfect, and my telephone invaded the sound at one point. Called Feather Feather, this band features a couple of people singing and a guy on violin, and most interesting of all, the man who La Fonta described as “not looking anything like Pierre Richard,” who is a famous French actor – notably in the 70s – played a very cool and interesting Finnish harp-like instrument the name of which I forget completely…. But have a listen, because it is very cool.